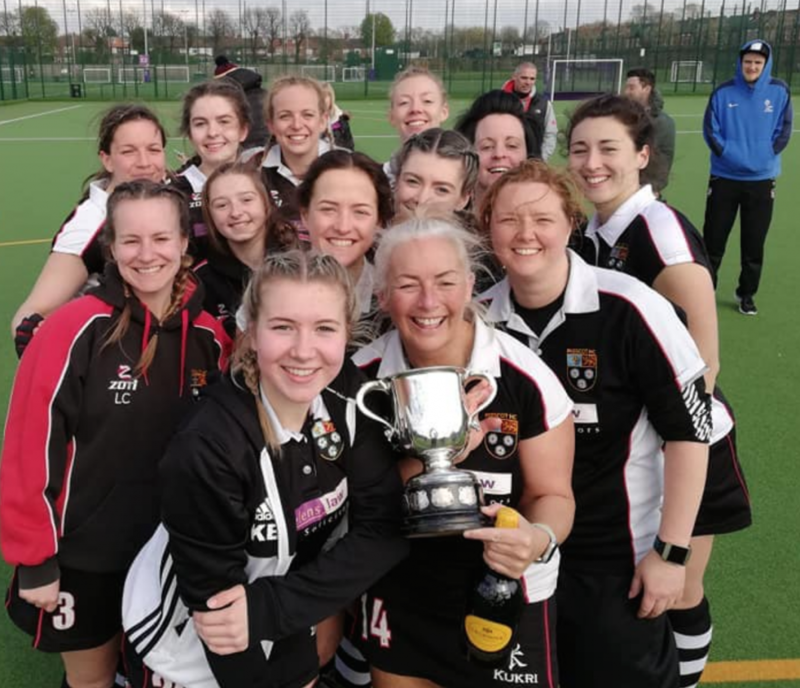 The Prescot ladies hockey team pulled of an amazing Treble this season by winning two Cup Finals this weekend to go with their Division One Championship and promotion. 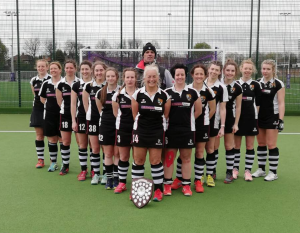 Prescot had already beaten Urmston three times this season but each game had been close as the Manchester side had finished third behind Prescot in the League. The final was a cagey affair with both sides’ defence on top throughout the game. With no real clear cut chances in the seventy minutes it became a penalty flick contest to decide the Cup. 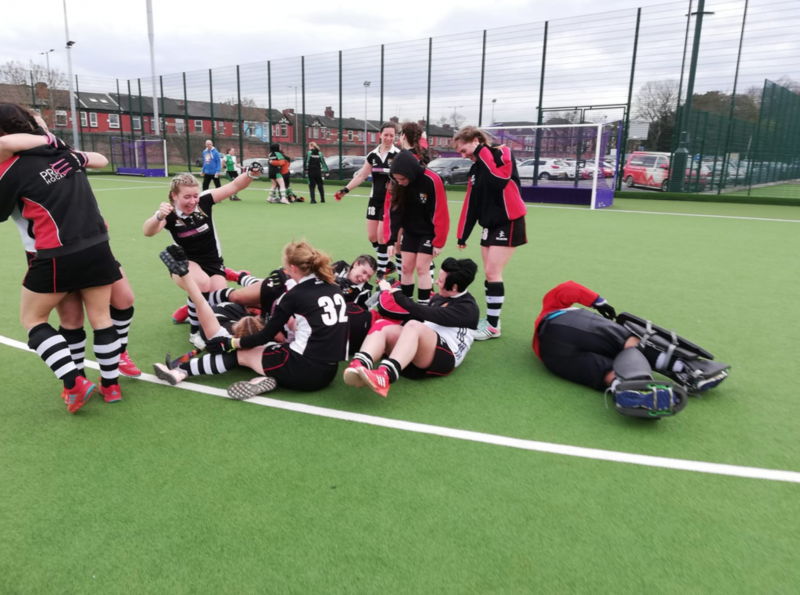 Prescot scored their first two whilst in goal Foy pulled off three fine saves to give Prescot the win and clinch the Division one League and Cup double. 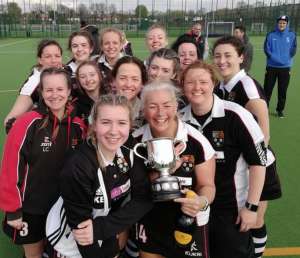 Knowing Prescot were already Division One League and Cup winners the ladies had less than 24 hours to recover and play a much more powerful Didsbury ladies team on their home pitch in the All Division Cup Final. Didsbury started the brighter and took the lead much to the pleasure of their home and very vocal support. Soon after Prescot found themselves two nil down and the hopes of a ‘treble’ were fading fast. However, a stirring team talk from coach Mark Heaps saw Prescot put in a huge shift for the final thirty five minutes of the season. Smith pulled a goal back midway through the second half and Prescot poured forward to strike a deserved equaliser in the final five minutes. Two two at full time meant more dreaded penalty flicks. 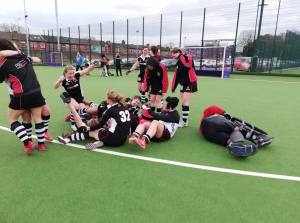 Didsbury and Prescot matched each other to four each before Foy pulled out a superb save to give team captain Mel Heaps the opportunity to score the decisive penalty and win the All Division Cup and the historic Treble. No team has ever won all three trophies in the same season! 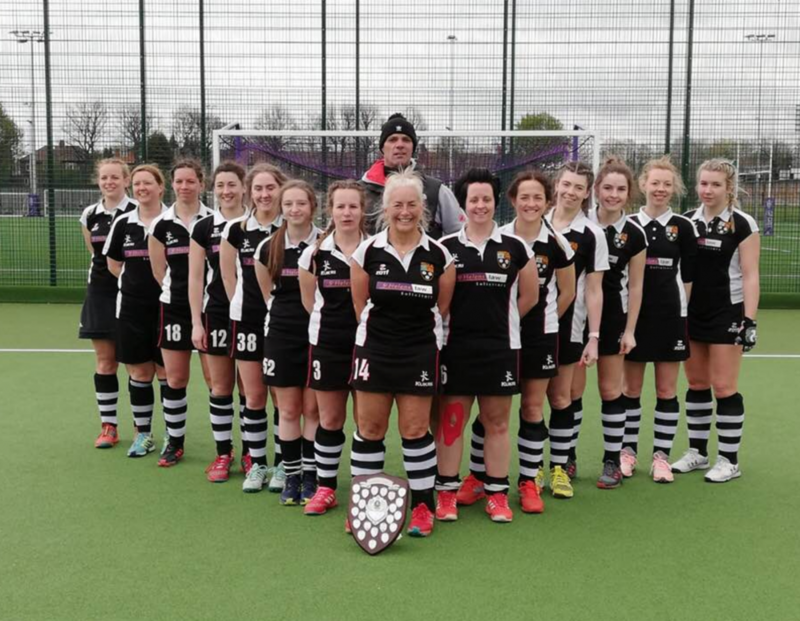 These final two cup wins cap a fantastic season for Prescot Hockey Club with both ladies and men’s teams promoted to the North Pennine League for the first time.